The Queen Mother of Pink passed away a few days ago, at 101, in her own home, just as she’d said she would. She lived her life her way, tiny and fierce, short of stature and strong of will. She was the nicest person I know of, and certainly the nicest person I’ve ever known in person. Nice was never the same as weak – she had a will of iron. I learned a lot from her. And so, finally, one last Thank You note – late, as usual. So, you’re dead. I’m sure you’ve finally got WiFi now, so I know you’re reading this. I’ll miss your reply, typed on the old Smith Corona – I never understood how you did that with non-standard paper sizes. Even the checks were typed. Thank you for teaching me what power grandmothers have. My earliest memories of you are from Omaha: You and Grandpa were visiting, and I was perhaps 5 or 6. I had been being my most usual self, I’m sure, and was about to get in trouble for it. I heard the words, “Do you need a spanking?” And suddenly, before I could say anything, I heard “Oh, not while Grandma’s here!” I’m sure my mother must have been near apoplexy, but to me, this was paramount to Mr. Rogers himself reaching through the television to intercede on my behalf. Wow! Thank you for providing a road map on how to age without really getting old. You earned a college degree in the 1930s, and you never stopped learning. Learning to drive in your 50s? Going back to a local college in your 70s and 80s, to audit courses about the history that you’d lived through? That’s genius. 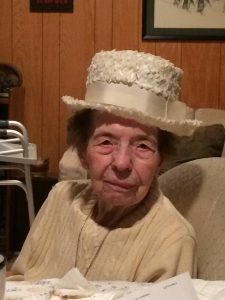 Staying in your house, in your 90s and 100s, because it was your house and you damn well felt like it – that was maybe a little goofy, but strong. And reading – I didn’t get to your house very often, but there were always books. Not a library, hording them like I do, but you were always reading some new books. And thank you for being an example. As I face my 50th year, I think of all the things you saw. You saw two states admitted to the union, and three Federal holidays created. You were there to see cars replace horses; you saw Ford replace the Model T with the Model A. You saw the infield fly rule amended to not apply to bunts. You lived through 18 Presidents, starting with Woodrow Wilson. (Jimmy Carter was the first one younger than you were!) You saw the end of the Great War, and then presided over a century that saw little else. And yet none of those things made you jaded, or less hopeful – not even the infield fly rule. You saw the good in people. Thank you for sharing some of the stories about that history. You told me that when the victory in Europe was announced in May of 1945, and everyone was banging pots and pans in the street to celebrate, you had to use a stool to reach some of yours from the cabinet – and this was when Uncle George first realized, “Mommy, you’re short!” The end of the war? Never mind that – his mom had to use a stool to reach the pots! Man, that was a milestone! One of these days, I shall compile my letters to you, with your replies, and post them as an epistolary record. Just to be goofy. I’m sure you’re enjoying things there. I hope they have Twinkies, and Peeps for Grandpa. We’ll keep things moving down here, and we’ll try to live up to the examples you set – in niceness, in compassion, and in strength. Maybe not in pink, honestly, but I’ll see what I can do. Still aint’n dead. Missed most of the last year – slept right through it. Will work on updating this more often – a genuine, shiny new year’s resolution. Hey, I’ve got to have something to fail at, right? Be well, stay safe, think positive thoughts about the end of the current administration. The watchword for 2019 is HOPE. Oh, and be nice to each other while I’m away. Your fellow humans are going through a lot right now. A friend pointed out to me an article by a Luddite, who derides the recent SpaceX launch as frippery, Elon Musk as a modern-day Louis XVI, and the entire idea of space exploration as something humanity shouldn’t be allowed to play with until we clean up our room. After some consideration, I’m not going to link to the article. I’m sure you can find it if you go looking. I disagree with the author completely. His main point is that since the space program hasn’t ended war, poverty, or famine, it’s worthless. The 1969 moon landing didn’t end the Vietnam War. That’s true. Also true is that space programs like the International Space Station (ISS) foster cooperation between governments, helping to build mutual understanding as a result of international cooperation among nations. So far, more than 63 nations have worked together on the ISS. That kind of visible, public teamwork among potentially rival nations may not end the current wars, but can help prevent the next one. Investment in the Apollo Moon exploration program in the 1960s also correlates with the level of technical education later attained by students, suggesting that the program’s high public profile positively influenced the level of US technical education. Having a visible space exploration program encourages young people to pursue STEM fields. So far, more than 43 million students from 49 countries have participated in experiments and activities associated with the ISS – building a generation of scientists and engineers who could help with the world hunger problems the author describes. The assertion that “nothing of substantial worth was gifted to humanity as a result” of the space program is patently false. Even aside from the intangible truth that new knowledge has inherent value to humankind, there are thousands of examples of terrestrial benefits of the space program. Healthcare is a great place to start. Do you worry about osteoporosis? Prolia, a prescription drug to treat it, was developed in space. How about laser eye surgery? The technology now commonly used to track a patient’s eye and precisely direct the laser scalpel came from the space program. Have an inoperable tumor? The robotics that have made inoperable tumors operable, with a robot arm capable of performing surgery inside an MRI machine, came from the space program. For that matter, MRI technology itself was based on innovations from the space program as well. Do you drive? Goodyear improved the strength and durability of their radial tires in 1976, after developing a material for NASA to parachute the Vikings to a soft landing on the Martian surface. Firefighters wear a lot of gear when they run into your burning building to save you. A lot of that gear – from the breathing system, face mask, frame, and harness; to the air bottle itself, which is made of an aluminum composite material developed by NASA for use on rocket casings – was initially developed for the space program. Better baby food. Better solar panels. Better food safety systems – solutions for growing crops in space have lead to solutions for mold prevention on Earth. Safer bridges, cars, and roller coasters because of structural analysis software built for the space program. Memory foam, in your helmets as well as for your heinie. UV sunglasses. The camera on your cell phone. Portable cordless vacuums, god help me. Custom-fitted exoskeletons to help paraplegics walk, derived from space robotic systems. Implantable heart monitors and LED?based anti?cancer therapy. Water purification technology built for space exploration now purifies millions of cubic meters of water every day, in hundreds of towns. The author of this article is so myopically focused on the trees of poverty and famine that he misses the forest of humanity’s impending overpopulation crisis. “If Elon Musk wanted to do something spectacular, he’d have given the money to the poor instead of a spaceship to nowhere.” He offers no concrete solutions for *how* Musk should have used his money to alleviate poverty. “Give the money to the poor” is a child’s answer. Part of the importance of the launch was the cost – SpaceX spent $90 million (OK, plus the cost of Musk’s car), which is about $300 million cheaper than anyone else can do it. There are an estimated 43.1 million Americans living in poverty (or were, in 2015, per the Census Bureau’s estimates). At $90 million, Musk could have given each of them enough money to cover a cup of coffee at Starbucks, which would have impacted their lives… Not at all. Stephen Hawking said that “to confine our attention to terrestrial matters would be to limit the human spirit.” Elon Musk’s Telsa Roadster has people looking at the stars again, and I think that’s a very good use of his money. If this were a food blog, I’d be telling you about the wings we made for dinner last night while we watched the Opening Ceremony of the 2018 Winter Olympics. Luckily for you, it’s not, and I won’t, save to say they were awesome, if not actually historic. History and awesomeness, though, were on our minds as we watched the people, pageantry, and parades at PyeongChang last night. Athletes from Russia, without the Russian flag. History. Athletes from North Korea, marching side-by-side with their South Korean teammates, under a unified Korean flag. History. And, to the delight of the entire world, a well-oiled skier from Tonga, carrying a Tongan flag, shirtless despite the 28-degree weather. Awesome. Pita Taufatofua, a Tongan martial artist turned skier, will be only the 72nd person to compete in back-to-back summer and winter Olympics. Mind you, 5 of those people have done that multiple times – Japan’s Seiko Hashimoto seems to hold the record for back-to-back Olympic games at 7, starting with the winter games in 1984 and participating in every subsequent summer and winter Olympics through 1996. Terry McHugh of Ireland did it four times, from 1996-2002, as did Jaqueline Mourão of Brazil, from 2004-2010. If the World’s Favorite Oiled Tongan makes it to Tokyo in 2020, as he’s said he hopes to, he will be one of only 15 people to have participated in 3 Olympics in a row. He seems to be a bit of a nut, but I suspect you might have to be to compete at that level. This is a guy who understands that he doesn’t need a medal at these games – he’s already won. Speaking of winning, I am considering setting my sights on the Olympics as well. Since I really don’t look that good in coconut oil, I’m researching curling – and I think I may have found my people! They are – mostly – slow-moving, overweight, white people. I could do this! Some of the athletes at PyeongChang this year are older than I am. Mind you, they’re setting records for it, but still – my dreams of Olympic glory needn’t fade yet. Speaking of well-oiled machines, the dizzying, dazzling drone display was pretty damned impressive. That was probably the best commercial for Intel that I’ve ever seen. Between that and the fireworks, this Opening Ceremony was a clear and solid answer to the theatrical and technical masterpiece that was Beijing ten years ago.